Common Name: Dolichos pruriens, Mucuna pruriens, Cowhage, Cow-itch. Dolichos Pruriens is a chief remedy for the right sided pruritis. It relieves Intense itching of the skin but there is no swelling or rash. Itching is worse across the shoulders, around the elbows, knees and on hairy parts. Itching more at night and on right side of the body. It is also helpful in senile pruritis worse at night, on scratching and on the right side of the body. Dolichos Pruriens is also indicated in abdominal affections having colic from getting feet wet. Bloated abdomen, constipation with itching. This remedy also helps in liver conditions like jaundice and swelling of liver. Dolichos Pruriens also helps in treating haemorrhoids with burning sensation. Gums (upper) irritated, tumid, excessively painful, can scarcely take food or drink in the month. Dolichos relives Pain in the gums which prevents sleep. It is useful in Soreness and tenderness of gums in teething children. Gums swollen, neuralgic pains in them, worse at night indicate thois remedy. It is indicated for Painful sensation of the throat below the angle of the lower jaw on right side, it was as if a splinter three-quarters of an inch in length was imbedded vertically in that spot, pain worse by swallowing. 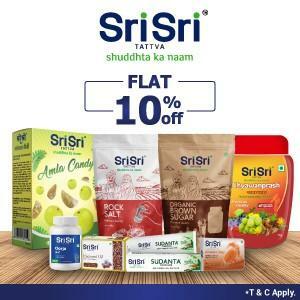 It is helpful in complaint of Bloated, swollen abdomen (with constipation). 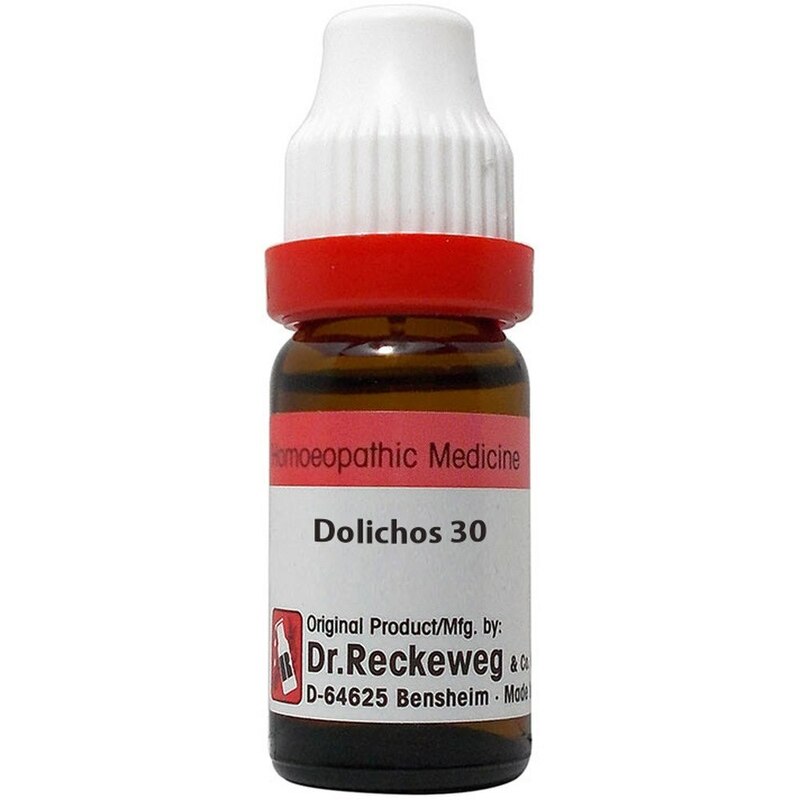 Dolichos is also used in complaint of Worms. 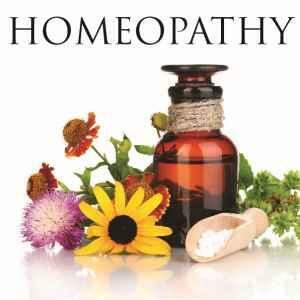 It is useful in Swelling of the liver. Dolichos is useful in Constipation during teething or pregnancy. Cough most troublesome about bed-time and for awhile after going to bed. Dolichos is useful in complaint of Cough, with wheezing and dyspnea. It relieves Sharp pain through upper portion of both lungs. Neuralgic pains following herpes zoster is relieved by Dolichos. Twitching of the muscles is checked by it. Dolichosis used in Intolerable itching all over the body, worse at night, preventing sleep, scratching worse the itching, there is nothing perceptible on the skin. 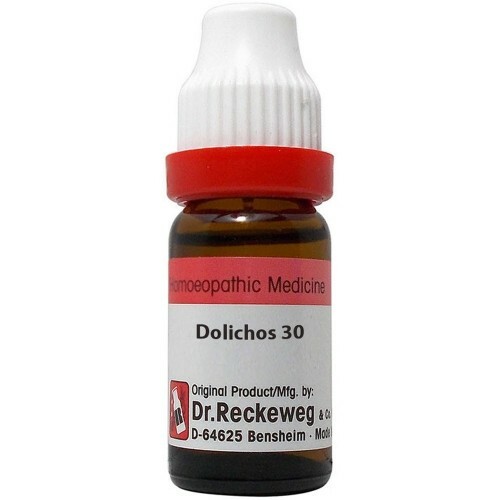 Dolichos also helps in complaint of Jaundice, with itching of the skin. Dry, tettery eruptions on arms and legs, resembling zona is relieved by it.